Electric vehicles are becoming a popular alternative to traditional internal combustion powered vehicles. From savings money on fuel, to reducing one’s carbon footprint, there are many reasons why today’s consumers are demanding electric cars. But how much do you really know about the ins-and-outs of Electric Vehicles (EVs)? With the expected rise in electric vehicle production it makes sense for managers, marketers, and consumers to gain a better understanding of the source fueling the battery electric car. This article offers an overview of the EV powertrain components, how they work together, and how they compare to the internal combustion engine in value. 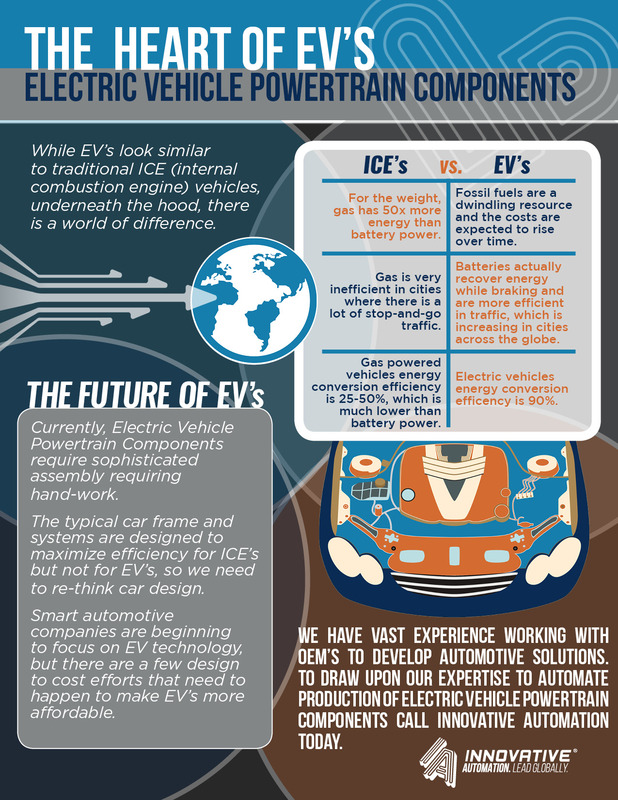 We have actually developed out a handy infographic to illustrate some of the core differences between ICE’s and EV’s. Although most Electric Cars look similar on the outside to their Gas-Powered cousins, underneath the hood things are very different. See below for a schematic comparison of the two. The functional elements of the electric vehicle may look conceptually similar to that of a traditional car, but the implementation is very different. Let’s take a closer look at some of the differences up close. We often take it for granted how valuable petroleum products are in terms of energy density. A kilogram of Gasoline contains about 46 MJ of energy, while a Lithium Ion Battery (the most common type used in EVs) has a maximum of a measly 0.875MJ. This means that for a given weight, gas contains more than 50X the amount of energy! That raises the question: why bother with electricity at all? There are many compelling reasons why we should move away from a gas-powered vehicle. A strong reason that is often widely discussed is the green-energy argument: burning gasoline is polluting and harmful to our health, the environment, and the earth as a whole. There are also strong economic arguments as well, and these will only get stronger as fossil-fuel reserves are further depleted, and alternative green-energy becomes less and less expensive. From an end user perspective there is also a huge cost savings as explored the Union of Concerned Scientists. There is also a benefit from an engineering perspective. As most readers will be familiar: cars with an Internal Combustion Engine (ICE) often reported worse efficiencies when driving in the city, than on the highway. The electric car flips this concept on its head and exhibit longer ranges during city driving than highway. As EV’s can harvest energy from braking, most of the kinetic energy spent to accelerate you when the light turns green is recaptured at the next block’s red-light. With an ICE, energy recapture is impossible; we don’t have the technology to create gasoline with the energy from braking and instead it escapes as waste-heat. On the highway, EV’s are actually less efficient. Aerodynamic drag is the biggest energy hog. Any cyclist will be familiar with this phenomenon: riding quickly into a headwind can be exhausting. 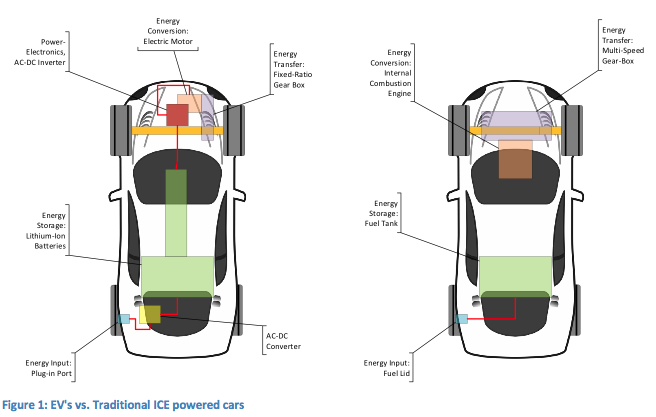 Car’s with ICE’s are simply less-inefficient, wasting energy through braking. Energy conversion from electricity is a much more efficient process than from gasoline. Electric motors can have efficiencies of more than 90%, compared to that of an ICE which usually is about 25-50% efficient. In-fact, no matter how well we engineer them, there’s fundamental limitations in how efficient an engine can run. No matter how hard we try, we will never be able to be as efficient as a simple electric motor. Another big problem for ICE’s is their limited operation range, limited to about 1500 to 6000 RPM. We must attach complicated, expensive and heavy multi-ratio gearboxes to allow them to produce usable power over the operation range of the car; from a standstill all the way to its max speed. As you can see, Electric motors don’t necessarily require expensive multi-ratio transmission components, which simplifies the vehicle design significantly. Battery technology has moved forward leaps and bounds in the last 20 years. We are reaching the point where it is economically sensible for the average person to invest in an Electric Car, considering the costs, range and re-charge times. There are still challenges however. Battery design is a big challenge, OEMs will be investing significant design-to-cost efforts into this major component in the years ahead. With the exception of the Nissan Leaf, most electric vehicles require sophisticated liquid cooling circuits to keep their batteries operating properly. This adds to the battery complexity significantly. As of today, EV batteries involve a lot of manual work to produce, assemble and test. There’s a lot of design work that needs to go into developing solutions that can be automated. Automotive OEMs are masters at not re-inventing the wheel. They have optimized their car frame designs over decodes of research and development to squeeze every penny possible out of the cost to produce these designs. The issue: these designs have been optimized for ICEs, transmissions, exhaust systems etc. EV’s require an entirely new approach to the design. Expect to see EV costs continue to fall over the coming years as OEMs develop better, more efficient means of producing them. As EVs become more ubiquitous, innovative solutions will be required to produce them, and their powertrain components efficiently. Partners like Innovative Automation can help OEM’s by bringing a depth of automation experience to the table. Design for automation is a big consideration in EV powertrain components, and it’s a trend that we expect to see grow over the next decade. If searching for custom machine builders to automate your powertrain, contact us. Ehsan, M., Gao, Y., & Gay, S. (2003). Characterization of electric motor drives for traction applications. in Proc. Industrial Electronics Society, IECON’03, 891-896.